Blue Horizon Hotel is an all-inclusive family friendly hotel located on the beautiful sandy beach of Lalysos, a haven of windsurfing in northern Rhodes. Nestled among lush gardens, with a swimming pool, lovely restaurants and bars this hotel offers guests the promise of comfortable stay with modern amenities and warm hospitality. The rooms feature contemporary decor offering breath-taking views of the Aegean Sea, the mountain welcome guests to rest in utmost comfort and privacy with modern furnishings and facilities. Rhodes with its 300 days of sun per year and being one of the top five destinations in the world for wind surfing is perfectly suited for a fun-filled beach holidays. Rhodes is the fourth largest island in Greece and famous for its fine beaches, all year round Greek sun and exquisite cuisine. This part of Rhodes is known as a windsurfing hotspot with favourable winds and regularly host windsurfing championships, European and international. Excellent shopping, dining and sight-seeing options make Lalysos a favourite spot of tourists to Greece. 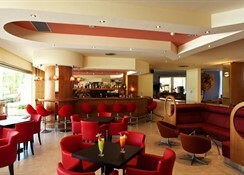 Blue Horizon Hotel is situated on the lovely beachfront of Lalysos, northern part of Rhodes, just 8km from the capital. Barely 400m from the lovely beach of sand and pebbles shore, it is within an easy walk of nearby attractions. Filerimos is at 5.3km from the hotel, while the Acropolis of Rhodes is at 7.8km. The distance to the nearest airfield, Rhodes International Airport is 7.3km. 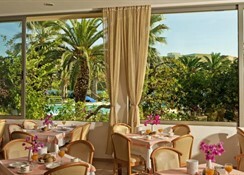 Blue Horizon Hotel has 222 well-appointed guestrooms with excellent views of the mountains, gardens or sea. The rooms come in types such as double room sea/mountain view, double/triple in bungalow with garden view, triple or quad suite with sea view and double room in bungalow with sea view. Family rooms are also available. These come with modern furniture, soundproof walls, blackout drapes, TV, mirror and balcony. 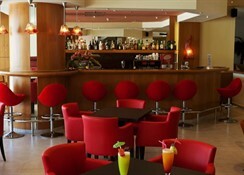 The hotel’s main restaurant allows guests to taste delicious local and international cuisine. Expert chefs dish out delicious meals prepared from the freshest of ingredients. Guests can also relax with a cocktail at the Blue Moon Bar. 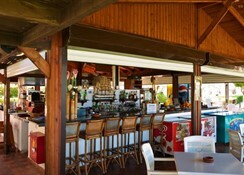 There is also a Surfer’s Beach Bar for drinks and light bites. Blue Horizon Hotel has a swimming pool and kids’ pool where guests can soak up all the sun. Guests can also walk down to the beach nearby decked with sun chairs and parasols. There is a fully equipped gym for those who wish to stay active. There is a lovely spa offering massages and therapies. 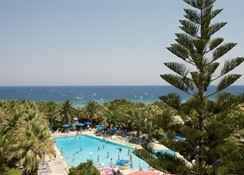 The hotel has facilities for water polo, basketball, tennis, beach volley and billiards. The water sports centre on the beach offers diving and windsurfing. There is lively evening entertainment too. Car rental can be arranged.